The Covington City Commission on Tuesday overturned a decision by the city's urban design review board (UDRB) and permitted the planned construction of a contemporary townhouse to move forward. The lengthy public hearing where Covington attorney Todd McMurtry appealed the UDRB's rejection of his planned new home that would be built on Garrard Street in Historic Licking Riverside followed an already long regular meeting of the commission. Combined, the city commission meeting lasted four and a half hours on Tuesday. The appeal followed two UDRB meetings. The first time McMurtry appeared, the plans were tabled for further review. The second time, the plans were rejected in a 4-3 vote. The next step in the process is an appeal to the city commission where statements can only be made by those who spoke at the previous UDRB meeting. Architect Andrew Piascowy gave a lengthy presentation in support of his contemporary design for the home which would be constructed on property currently owned by attorney Stephen McMurtry, Todd McMurtry's father. The elder McMurtry's home faces Sanford Street. "In general, it is encouraged that new buildings not reproduce the look of historic buildings," Piascowy said. "Context is the most important component. The overall appearance, height, details, setbacks, window shapes and positions, door placements. The image that comes to mind when you think about Covington is an Italianate design. (But) as you walk through the neighborhood, there are a whole bunch of designs." Piascowy countered criticism of his design as being different by pointing out bungalow homes, 1920's multi-families, a craftsman home next to a Queen Anne-style mansion. He also cited the historic preservation bonafides of his firm, Ft. Wright-based PCA Architects, which worked on the reconstruction of the Odd Fellows Hall on Madison Avenue, the Ice House renovation on Scott Boulevard, and the exterior lighting placed on the landmark Cathedral Basilica of the Assumption. To mimic the surrounding historic architecture with the McMurtry home, however, would be a mistake, the architect said. Besides, he added, there is already a lot of variety there: different window patterns, facade designs, and good and bad examples of infill construction. Preservationist and neighbor Lisa Sauer returned to express her disapproval of the plans. "Infill failures detract from our neighborhood," said Sauer, a member of Progress With Preservation who has spoken on other preservation issues at City Hall, such as the proposed demolition of the Bavarian Brewery Building. 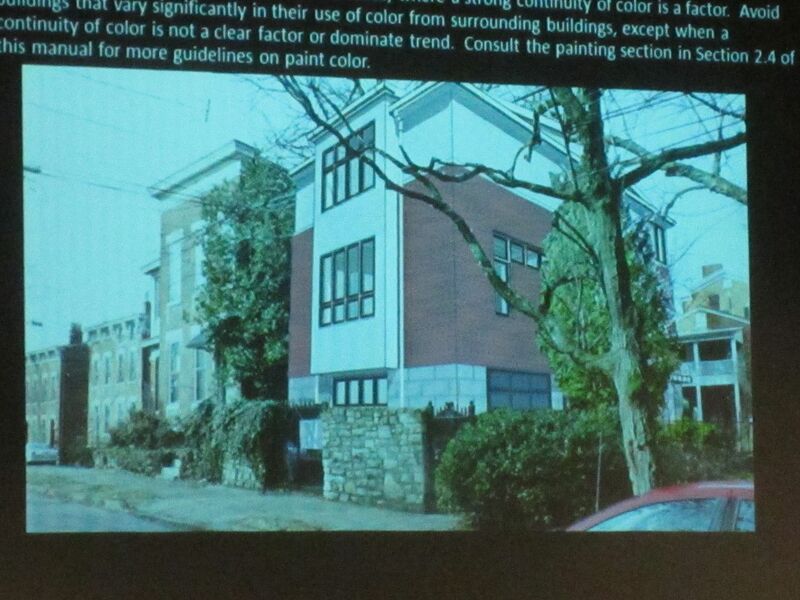 Concerns about the 3-story modern townhouse include selected materials, window placement, and facade. Both Piascowy and Sauer cited the city's historic preservation guidelines to support their different arguments. However, the McMurtrys discounted Sauer's statements as not coming from an expert. Todd McMurtry cited Sauer's LinkedIn profile and pointed out her various business and finance experience and noted that she would not be permitted as an expert witness in court. Mayor Sherry Carran scolded the effort to discount Sauer's position. "She may not be of the background with a degree in architecture or design ability like (Piascowy) but as far as her experience in historic preservation and what she has done for the city and Cincinnati preservation, she has our respect," Carran said. "You probably lost a point by what you just said there." Carran ultimately joined Commissioners Chuck Eilerman, Steve Frank, and Jordan Huizenga in voting to overturn the UDRB's denial, while Commissioner Bill Wells voted against the effort. 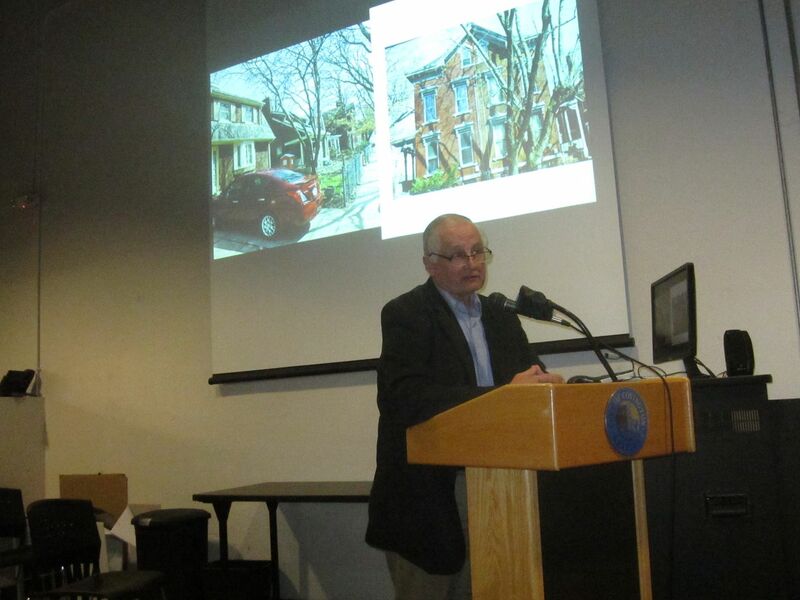 Many issues clouded the proposal, including disputes over the legal make-up of the UDRB which includes Newport resident Jim Guthrie, an architect who serves on the UDRB as a representative of a national architects organization, as well as the city's lack of a historic preservation officer during the process. Previous historic preservation officer Beth Johnson took a similar position in Texas and while the city commission on Tuesday hired her replacement from Coral Gables, Florida, that candidate will not assume the responsibilities until June. Zoning administrator Andrew Juengling has served as interim historic preservation officer. Had the city commission upheld the UDRB's decision, the next step for McMurtry would have been to appeal to Kenton County Circuit Court as is the case with the Bavarian Brewery demolition which is still making its way through the legal system.